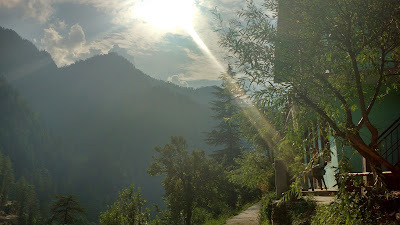 Jibhi - a small charming village in the Inner Seraj Valley - is an idler's paradise. 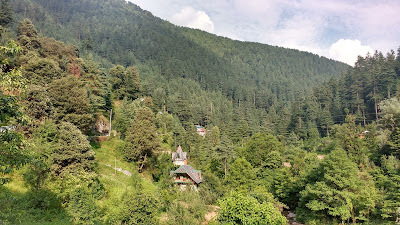 The beauty of this village lies in the seemingly long and slow mountain days that are bundled with gifts of sprightly streams, crisp air and tall cedar-pines. 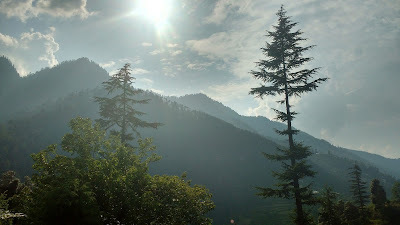 A wisp of smoke escapes through the slated roofs of the numerous wooden houses; a streak of sunlight illuminates sunny-orange flowers; flakes of cotton drift off with the breeze from the cotton tree; an occasional car passes the high road towards Jalori or Banjar. Its all here. 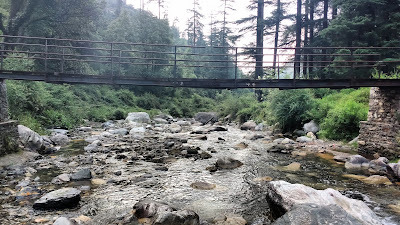 Jibhi - pronounced Zibbhi locally - is located in the HP State Highway 11 at a distance of 6km from the town-like Banjar and 12km from the top of the iconic Jalori Pass via Ghiyagi and Shoja. 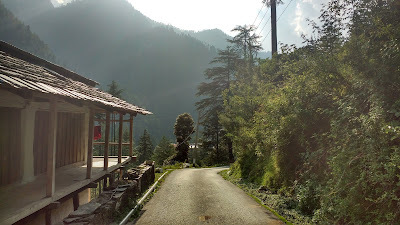 Technically speaking, this is the shortest road between Shimla and Kullu/Manali; however the narrow winding road usually allows only one vehicle to pass through at a time and hence the area has not yet come to the attention of the package tour crowd. There are plenty of backpackers though - Indian, Israelis, Russians and possibly Greek too. The road is now designated to be converted to a National Highway with the high mountain pass of Jalori slated to be replaced by a tunnel. That will dramatically change the tourism here - a fact which is easily registered by the high number of home-stays mushrooming in the valley. 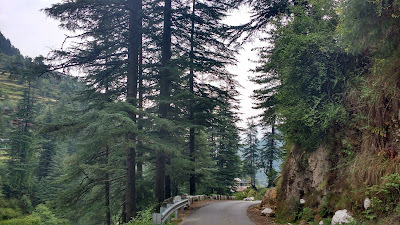 Jibhi can be accessed by local buses that ply from Aut (Manali Highway) and Rampur (Kinnaur Highway). Shorter routes can be interchanged at the major depot of Banjar. Local taxis from Jalori and Banjar are also available. Jibhi has two bus-stops - Market and Zero-Point. There are numerous home-stays in Jibhi catering to a variety of wallet-sizes. 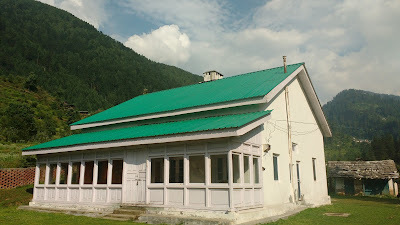 Doli Guest House in the market area is a revered name and is the oldest of the lot. A Forest Rest-House is located at some height above the highway and offers great views. 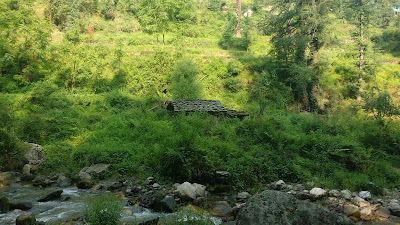 This apparently colonial place can be booked by calling at the Forest Office in Shamshi. 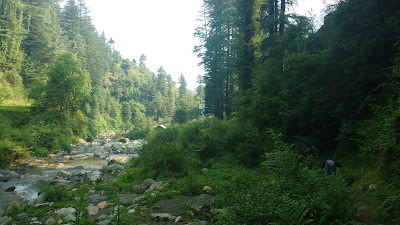 We stayed at the Pinewood near Zero-Point off the road that forks off for Gada-Gushaini. A dirt path forks downward after about 500m to the right almost to the level of the stream. The location of the place was such that we spent almost all of our free day-time reading books sitting on the boulders in the stream. About 250m after taking the Gada-Gushaini fork, one finds another newer fork heading left. About 100m later, a water path branches to the right. 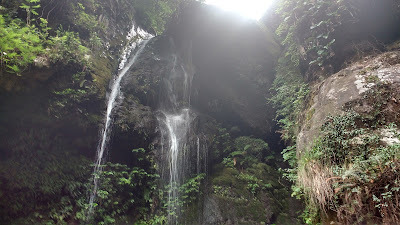 100m on this path through the forest brings one to the picturesque Jibhi waterfall. 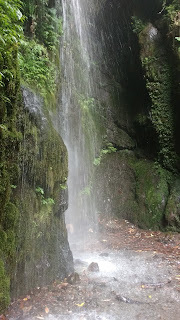 The waterfall is safe, but the water is chillingly cold; as is the soft breeze that blows by. We did this walk quite often, especially to board local buses for other side trips. The Pinewood is located on the left bank of the stream. Next to the Pinewood was an iron bridge on the other side of which a trail continues upward to the market. 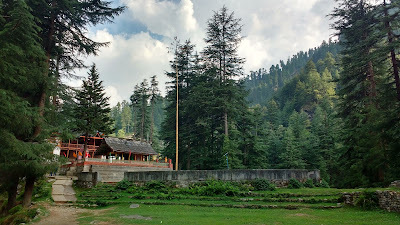 This trail starts from the Jibhi market area near the Doli Guest House, ascends steadily to the Shesh Nag temple, then again to the Forest Rest House. 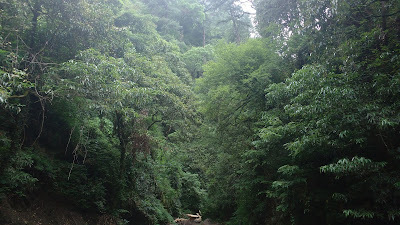 A concrete road and a trail then descends to the main highway about 200m from the Zero-Point. 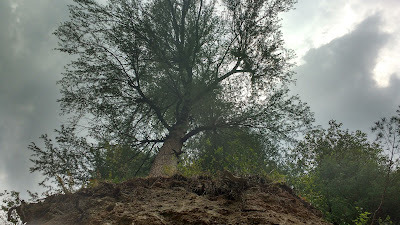 From this point one can see the iconic fairy-tale castle-house of Jibhi. 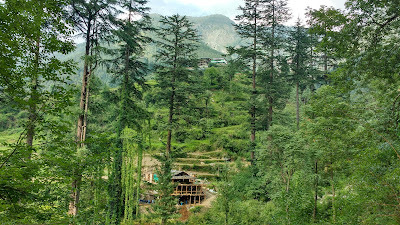 We stayed in Jibhi for four nights. We used Jibhi as a base to cover nearby places like Chehni Kothi (Fort), Jalori Pass, Raghupurgarh Fort and Ghiyagi. 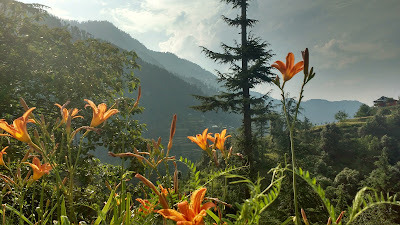 Jibhi is a gem of a place - at least for now - and a happy retreat. Come to Jibhi. Do nothing here; just implore and rediscover yourself. It looks like an interesting and peaceful place. Very informative post. Visited here in June 2016. Its open all year round.